Welcome to the Texas Gulf Coast SPAAMFAA Website! 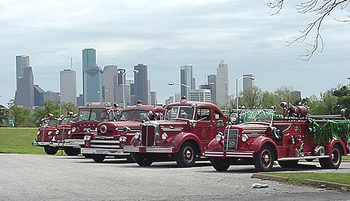 Serving Fire Apparatus Buffs in the Greater Houston, Texas Area! Welcome to the Texas Gulf Coast SPAAMFAA website! Membership in the chapter is about 50 members located throughout the greater Houston, TX area. Ownership of an antique piece of fire apparatus is not a requirement of membership. If you would like more information regarding the website or membership, contact the webmaster. We hope you find the information on the website beneficial. Texas Gulf Coast SPAAMFAA meets every third Monday of the month. The next meeting is expected to be on Monday, April 15th. at 7PM and location is to be determined. New members are always welcome! SPAAMFAA® Is the Registered Trademark of the Society for the Preservation and Appreciation of Antique Motor Fire Apparatus in America, and may only be used by permission.